The fairly small range of vision and lack of an in game map was a very intentional part of the game but I figure that by now any people who were seriously interested in Pineapple Apocalypse RPG have probable already played it enough to have lost that initial interest so I figure there’s no harm in sharing this. 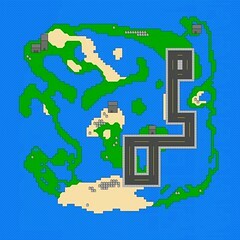 Its a map of Pineapple Apocalypse RPG. Click it to see it in “large” (1024×1024) which is as big as it seems flickr will allow though even that is considerably downscale. If anyone wants the full sized pixel perfect image I’ll upload it somewhere else. 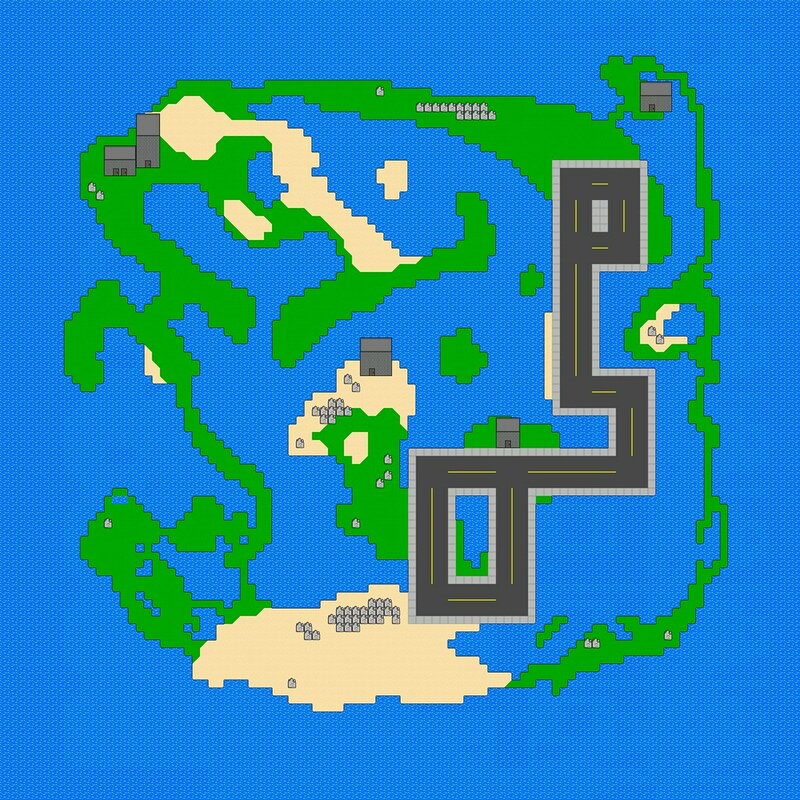 It looks a lot smaller when you see it all together at once like this… I had actually never seen the complete game world until I made this map a day ago. The way I placed the tiles that make up the world was just with a kind of hacked together in game editor (which come to think of it may still be accessible in the PC version though as I cant seem to remember whether or not I cut out the ability to activate the mode for the final version I posted) which didn’t actually give me any better a view of the world. I imagined it being bigger somehow. Anyways the reason I bothered making the map was because I was messing around with updating Pineapple Apocalypse RPG for Wii. Nothing major and I’m not sure when I’ll get around to finishing the changes but I have already worked in the home menu system from my other games so it no longer just immediately exits out when you hit the home button. Adding in a confirmation screen for saving and loading will be really really easy to do. Mostly I’m just being lazy and avoiding learning how to get a simple Wii SD card file browser working (which is whats needed for that music player that I want for the menu system and to a lesser extent also the screenshot viewer). Once I get the file browser done I’ll be able to slap together the other changes I want and have a new version of Pineapple Apocalypse RPG up in no time. A Dance Clone update will then quickly follow it. Also I’ve been messing around with making a Pineapple Apocalypse RPG sequel. Wont say more till I have more done. Next Next post: Random pages for devs.